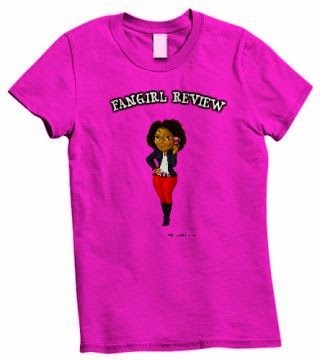 Fangirl Review: Once Upon a Time S4, Ep. 3 "White Out"
Once Upon a Time S4, Ep. 3 "White Out"
Show starts with Elsa freezing the town and refusing to let anyone out until she is reunited with Anna. Past - Anna met with David who apparently knows Kristoff and immediately identifies her as Kristoff's fiancé. Little Bo Peep shows up and David (Charming) tells Anna to hide. Present - Henry is making a basket to help Regina get over her past. A black crow arrives with message from Regina to Henry. She says she doesn't want to see him. A black out occurs in town. Dwarves and Grandmom show up to Snow and tell her that she is now the mayor. Charming, Emma, and Hook are at the ice wall and they wonder why. Emma walks inside the ice wall and meets Elsa. Elsa informs her she is looking for Anna. Past - Bo Peep wants her payment. She is a jerk and controls them. She brands them as one of her sheep and says they will pay or she will own them. Anna wants to teach David how to fight with a sword. Present - Hook and David run into the ice wall which causes Elsa to freak out and an avalanche to occur, trapping Emma and Elsa. The recognize they need magic to undo it. Past - Anna is working with David and is beating the crap out of him. Present - Emma wakes up. 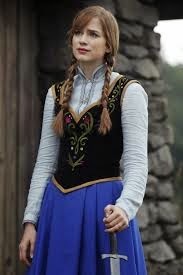 Elsa demands them to find Anna and then she will free Emma or she will freeze the whole town. Emma and Elsa bound over having magic they cannot control. Emma is slowing dying by hypotherma. Hook and David show up to Gold and ask about the necklace. David sees the necklace and realizes that he knows Anna. In the past Bo Peep took Anna. 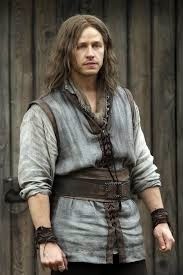 Present Day David shows up to Bo Peep. The rough her up and take the shepard's crook to find Anna. Past David confronts Bo Peep and fights her people then her. He wins and takes the necklace back. He is able to find Anna and gives her back her necklace. Present - David talks Elsa into saving herself and Emma. She is able to focus and make a hole to get them out. They warm Emma up and plan to find Anna. Past - David's mother lets Anna know about someone that can help in regards to magic. We all know she is talking about Rumple. Once Anna says his name we see the Rumple looking at her in his magic ball. Present - They use the crook and hear a heartbeat so they know she is alive. The gang plan on helping Elsa find her sister. Henry shows up to Regina's house and says he will not give up on her. Regina finally opens the door and they are reunited. Emma and Elsa go back to the barrier and she is unable to take it down but they cannot figure out why it will not come down. We see a blonde in an ice cream shop and we realize she has the same power as Elsa which may be why they cannot take down the barrier. Looks like Elsa will be facing off with the Snow Queen. My Thoughts: What I love about this show is their ability to have the characters meet in the past and overlap in the future. Well done on their part of having Anna know David before he was Charming. She actually was the one to teach him how to be a swordsman. I look forward to next week's episode and seeing Elsa face off with the Snow Queen. Where do you think Anna is by the way. Is she in town or still back in the enchanted forest or does Hans have her captive?